Few are the major international novels that have been set in Phuket, an exception being “Catching the Sun” by the well-known English writer Tony Parsons. Parsons has built himself a major following by writing, to my eye at least, rather maudlin, over-analytical books about that great preoccupation of the British chattering classes – relationships. Baz takes and break and enjoys the view. Baz on the backroads of Nai Yang. Delicious sausages – the perfect end-of-ride indulgence. The titles themselves are a dead giveaway as to the cloying content within. Man and Wife; Man and Boy; My Favourite Wife; The Family Way – you get the drift I’m sure. The titles suggest that you shouldn’t delve into the burgeoning Parsons oeuvre without a jumbo-sized box of Kleenex and the number of your psychotherapist on speed-dial! Parsons set his 2012 novel Catching the Sun on Nai Yang Beach where we find a disillusioned ex-English taxi driver, plus sulky wife and kids, trying to make a go of it in “paradise” having fled “broken” Britain. It’s not a particularly good book and is full of errors about Phuket, but one thing Parsons does get absolutely correct is the beguiling beauty of the Nai Yang Beach and surrounds. 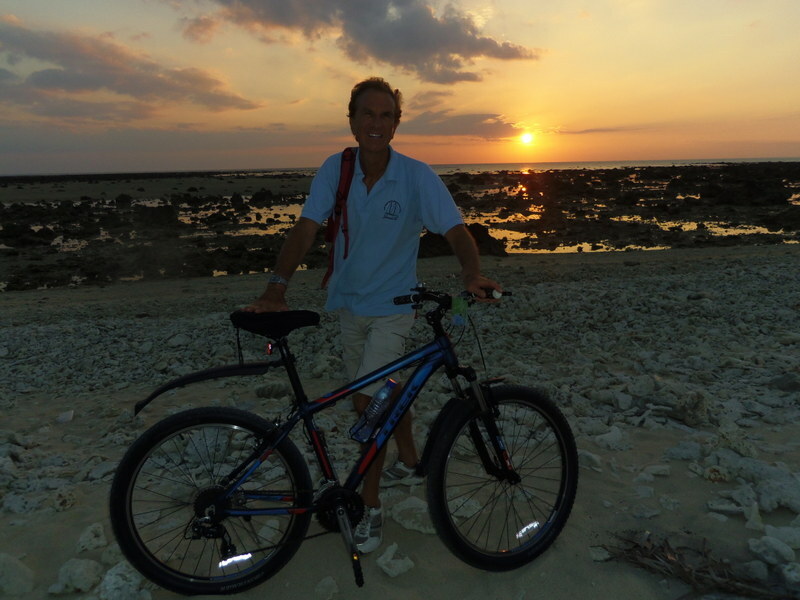 I recently enjoyed some relaxed cycling around this Parsons-land while staying at the Marriott Resort which boasts a splendid beach-side location at the southern end of Nai Yang. The resort offers guests cycling opportunities with sturdy mountain bikes for rent and also a guided tour option for a couple of hours taking in the local markets. Mornings and evenings are of course the best times of day for cycling around this area, as elsewhere in Phuket, and so on a January evening I took off at about 4pm for a bit of a two-wheeled nose around. Turning left out of the Marriott, I cycled along the little back road that leads firstly to Ban Sakoo Village and Soi 4019 and then over a lung-bursting hill into beautiful Nai Thon Beach. It’s a strange feeling cycling in this north-west corner of Phuket, so close to the airport that you can see the jets taking off and landing, and yet immersed in a quiet enclave we might label “Phuket-as-it-used-to-be”. Here little old ladies and kiddies in scout’s uniforms chat with their friends outside the local grocery store, while soi dogs scratch in the middle of the backroads and are reluctant to give way to the passing cyclist. It’s as though you have leaned upon a big brass bell-push labelled “Press Here for Authentic Thailand” and that’s exactly what you get, as long as you stay away from nearby the Thepkra­sattri–Nai Yang Rd with its rampaging mini-buses hurtling to and from the airport with malicious intent. 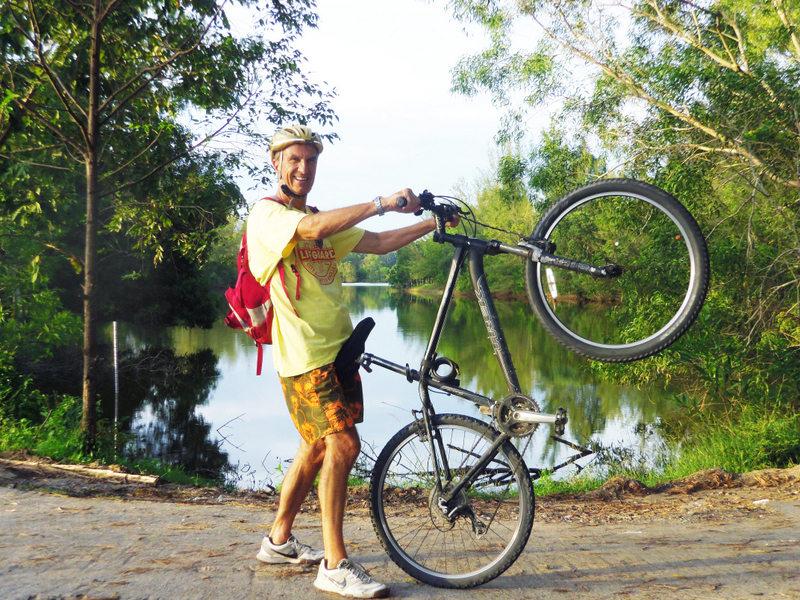 Alternatively you can cycle north from the Marriott out past the airport itself, then along the narrow road running parallel to the runway that will bring you onto Phuket’s main arterial Thepkrasattri Rd. Turn left here and you can cycle to the Mai Khao loop parallel to the eponymous beach and around the flooded tin mine lagoons of the Sirinath National Park. 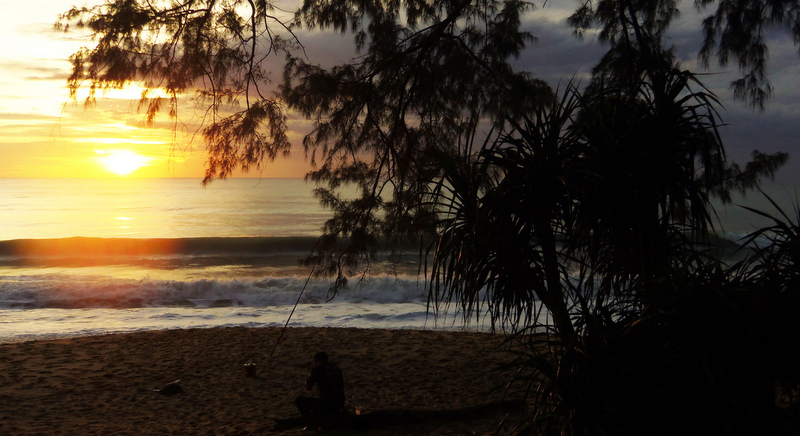 Or you can head further north still, to the Sarasin Bridge, which is a lovely spot for an evening swim and a sun-downer at one of the ramshackle wooden bars under the beach-side Casuarina trees. Once back at the Marriott, I managed a relaxing swim in their huge pool that fringes the beach, followed by a special treat. 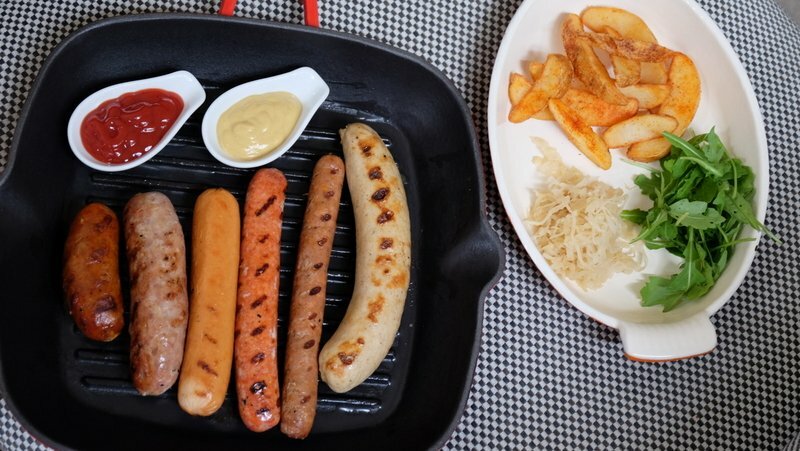 In the scenic Lounge Bar overlooking the Nai Yang sands, they are currently offering a choice from six tasty sausage plates served with sauerkraut and potato wedges plus an ice-cold beverage for just B420, which was just the thing to round off a perfect evening of cycling. Even grumpy old Tony Parsons would have been impressed.